The Muzik nightclub on the grounds of the CNE is where Toronto’s Crystal Palace was once located. This magnificent structure was inspired by the Crystal Palace that opened in Hyde Park in London on May 1, 1851. Its architect was Sir Joseph Paxton, and it was constructed for the Great Exhibition, the first international exhibition ever held to feature manufactured goods. The event was an idea of Prince Albert, consort of Queen Victoria, designed specifically to showcase Britain’s Industrial achievements. The queen officially presided at the opening and during the months ahead, it attracted immense crowds and was considered a grand success. The Crystal Palace derived its name from its building materials—support frames of cast iron and numerous expansive panes of glass. Its architecture inspired similar structures throughout the world, the most famous being in Dublin and New York. There were also modest versions of the Crystal Palace erected in Ontario—in Kingston, Napanee, Picton and Toronto. The Crystal Palace in Picton was restored in 1997, and is today the only structure of this type that survives in Canada. It now is part of the annual Prince Edward County Fair. The Crystal Palace in London, England. Photo from Wikipedia.org. In Upper Canada (Ontario), agricultural exhibitions commenced in 1846, under the auspices of the Provincial Agricultural Association and Board of Directors of Upper Canada. Toronto was chose as the site in 1848 and 1852. Because of their success and the positive effect on the economy of the host city, Toronto decided to construct a building explicitly for holding such exhibitions. About the year 1855, a design competition was held, the structure’s cost not to exceed 5000 pounds. The winning architects were Fleming and Schreiber. Influenced by London’s Crystal Palace, they designed a structure of glass and cast iron. It was erected on the south side of King Street West, near Shaw Street. Though it was to feature recent agricultural trends, following London’s example it was also to display the latest industrial technology. Thus, they named the new building, The Palace of Industry, although it was commonly referred to as the Crystal Palace. The Palace of Industry opened in September 1858. Built in the shape of a cross, similar to a cathedral, its entrance was located on the south side, on the right-hand arm (transept) of the cross. In the centre of the cross, there was a sixty-four square-foot open court, two storeys in height, lit by natural light from an enormous skylight. The cast iron for the supporting frame of the structure was manufactured by the St. Lawrence Foundry, the same firm that in 1867 created the cast-iron fence that today surrounds Osgoode Hall at Queen Street West and University Avenue. Toronto’s version of the Crystal Palace contained more cast iron than glass, and remarkably, was built in 90 days. The Palace of Industry consisted of two storeys, with 20,000 square feet of display space, and an extra 5000 square feet in a gallery. Large windows dominated the lower portion of the structure, its upper section consisting of a solid domed roof. It was a magnificent building for its day, especially for a city that possessed only about 40,000 people. The popularity of agricultural and industrial exhibitions continued to increase, their locations rotating to various locations throughout the province. However, Toronto wanted to be the site of a permanent exhibition, as the city was well aware of the economic impetus it would provide. In 1877, Toronto was again selected as the location, and a highly successful exhibition was held on the King Street West site. The crowds resulted in the city realizing that if it wanted to host a permanent exhibition, the Palace of Industry needed to be expanded. Water colour of the Palace of Industry on King Street, Toronto c. 1877. Toronto Reference Library Archives r-2883. The Crystal Palace on King Street, Toronto. Toronto Public Library Archives, r-2877. To fulfill Toronto’s ambitions for a permanent exhibition, city council voted to lease 60 acres on the western part of the Garrison Commons. The old exhibition site on King Street was sold to the Massey Manufacturing Company, the money derived from the sale applied to the construction of a new Crystal Palace. The Massey Company constructed an industrial complex on the King Street land, but today, only one of the buildings remains. It was renovated to create a condominium residence, known as the Massey Harris Lofts, at 915 King Street West . 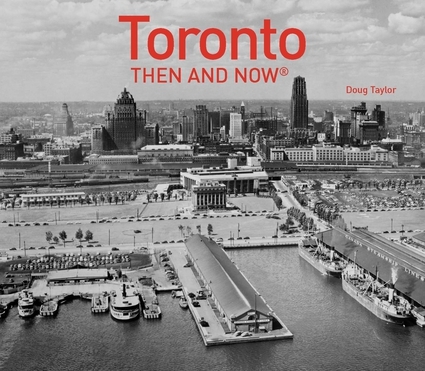 The first permanent exhibition opened in Toronto on September 3, 1879. Named the “Industrial Exhibition,” the Palace of Industry was one of the six permanent buildings on the site. None of them survives today, as except for the Industrial Palace, they were all constructed of wood. Relocating to the site beside the lake resulted in increased attendance at the event, since it was better situated for public access; people were able to arrive by rail, steamship and streetcar. The Crystal Palace was the most important building at the Industrial Exhibition of 1879 and its importance never diminished. For two and a half decades, it was synonymous with the exhibition and was its main symbol. It was destroyed by fire in 1906, but not every Toronto historian has lamented its passing. Frederick H. Armstrong in his book, “Toronto—The Place of Meeting,” stated that the Crystal Palace “was put out of its misery by the fire in 1906.” Armstrong was not impressed by its architecture, especially the cupola. The photos that follow will allow readers to judge for themselves. On the site, in 1907, the CNE’s Horticultural Building was erected, which is now (2015) rented to the Muzik night club. However, the building is not as close to the water’s edge as the Crystal Palace, as during the years ahead landfill pushed the lake further south. The name of the Industrial Exhibition was changed in 1912 to the Canadian National Exhibition (CNE). Water colour, the view looking north from Lake Ontario to the grounds of the Industrial Exhibition c. 1880. The Crystal Palace dominates the scene. Archives of the Toronto Public Library, r-3954. Toronto’s Crystal Palace in 1882, photo from the collection of the Toronto Public Library, r-4109. The Horticultural Building at the CNE on August 2, 1928. It was constructed in 1907 on the site of the Crystal Palace that was destroyed by fire. Toronto Archives, Fonds 1231, Item 2046.